54 years has brought a lot of experience and history to our facility. We give daily tours to provide future log homeowners an experience that they won't find anywhere else in the industry. We've structured our services so that you don't need to visit us to have your perfect home, but our visitors do receive many perks. You will be able to explore our 8,000 sq. ft. showroom and our 2,688 sq. ft. professionally decorated model home. You will become acquainted with the manufacturing process as we show you how we dry your logs in the kiln and mill each log uniquely to fit the style of your home. If you are ready, we can even start your home design before you leave. We have had thousands of homeowners who have used our travel bucks program to offset their travel expenses. 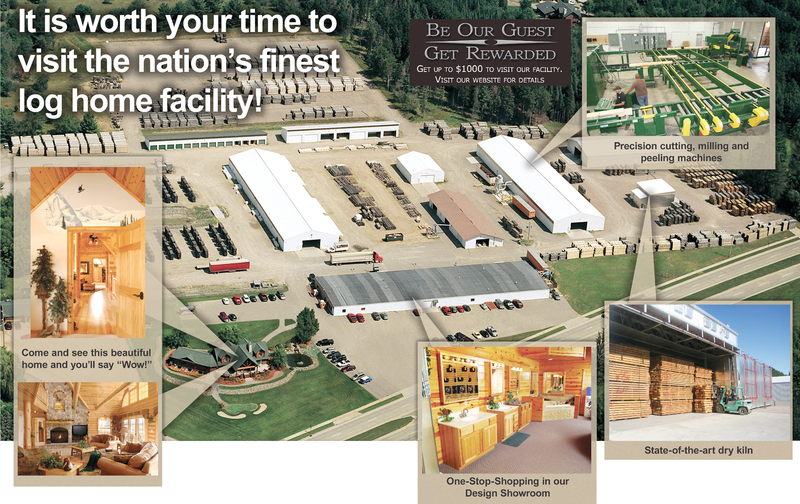 Travel Bucks will be awarded for one visit to the Golden Eagle Log and Timber Homes headquarters, in Wisconsin Rapids, Wisconsin. Travel Bucks are redeemable with a Golden Eagle Log and Timber Homes package purchase that exceeds $50,000. Travel Bucks are calculated based on a one way trip from your primary residence to the Golden Eagle Log and Timber Homes headquarters in Wisconsin Rapids, Wisconsin. Mileage is determined by Google online maps. Only one Travel Bucks discount is valid for each package purchase. When visiting the Golden Eagle Log and Timber Homes facility you can fly in to one of the area airports, you may want to consider staying at a local hotel and consider taking in a few of the area attractions.